My kids love to play with their food, so recently we used food to talk about density, buoyancy, and mass. My favorite thing about this sink or float experiment is that it’s appropriate for all ages. Here are a few ideas for how to involve all the kids in this fun water activity. The older children should also be able to talk to the little kids about examples of things that float and why. Leaves float down the river bed, but stones sink. Submarines can sink and float. How? Get the older ones talking and challenge them to engage the little ones on their level of understanding. It’s great for the kids to get reminded of the concepts that they already understand. Talk in vocabulary that they are comfortable with. Help direct the conversations to combine the mass and volume concepts to talk about density. This discussion will get the little kids confident at making guesses for their food experiment. The younger elementary kids can work on building a chart to record the results. On the left side they should make a list of all the items to be tested. Across the top of the worksheet, I’d title the columns: Guess (Sink or Float) and Results (Sink or Float). 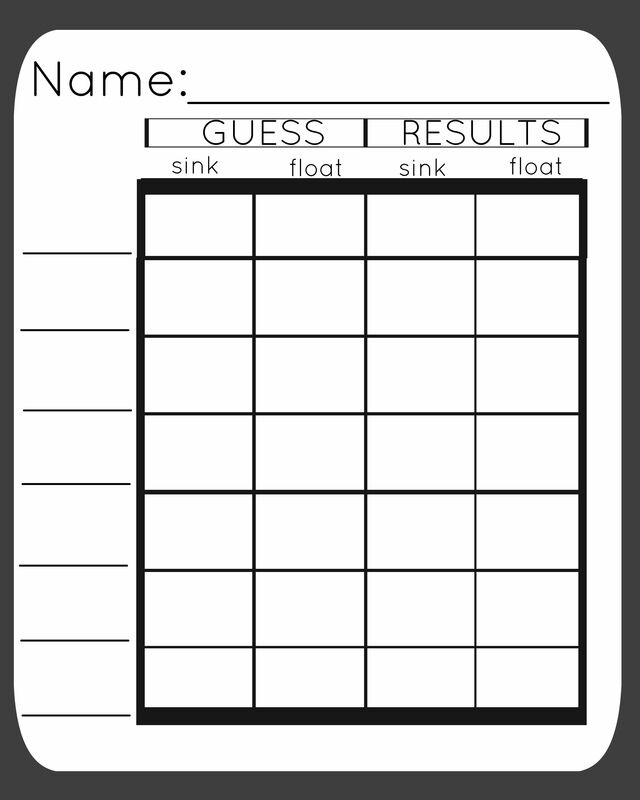 You can use this printable buoyancy worksheet and fill in your own test results. Use whatever you have on hand. 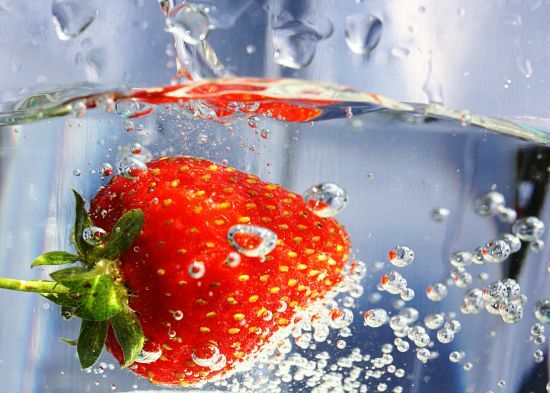 You could intentionally choose foods like bread and crackers that will absorb the water over time. It could be fun since you’ll get them talking about how that water filled the volume of the food and changed the buoyancy. Put the younger kids in charge of pouring the water into a large bowl. Let the preschoolers gently place the foods into the water. Let the youngest students be the ones to shout out if a food floats or sinks. Allow each preschooler to draw the foods instead of spelling the names on the worksheet. Make sure to have the kids register a guess for each food on their worksheet. Also, make sure that each child notes the results and sees how many they guessed correctly. Will they make better guesses after this experiment? Definitely! They’re having fun learning. Everyone can also come together to learn a fun and simple song about buoyancy to the tune of Row, Row, Row Your Boat. Warning: the Buoyancy Song is catchy and addictive. 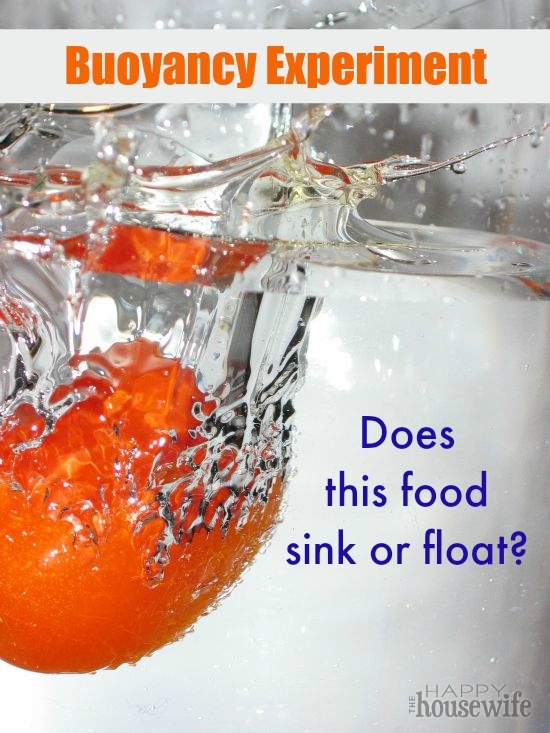 Now that you’ve learned about the buoyancy of the foods in your kitchen, check out this fun Sink or Float Experiment to play around and make educated guesses about whether some common household objects will rise to the top or sink to the bottom. You can use the same worksheet. What will you test?